My head is exploding with the new style structured blouses for Spring. My last blog post explains the ruffle shirt fascination alone which I’ve already caved on. For this post, I wanted to show you four simple ways to wear shirts. All these are men’s shirts because they are already boxy with the oversized cuffs for a mens-like feel, but you can invest in the oversized men’s style shirts that are popping up online now for women like this one from Topshop. This is a two shirt combo. Take a second shirt in any color that you want. I picked pinstripe for a twist on men’s saville row shirts. 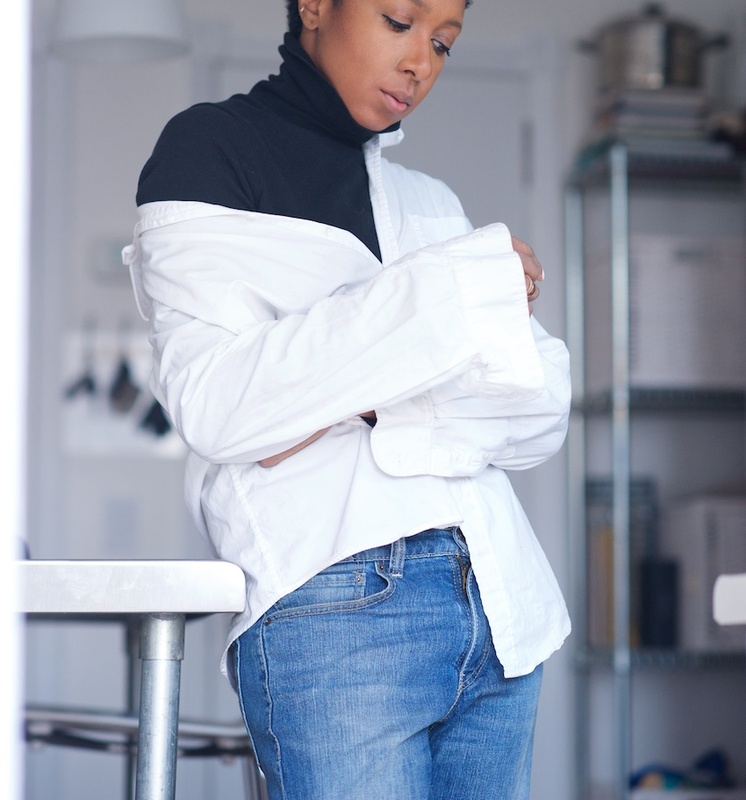 Fold down the collar and wrap the back of the shirt over your torso. Cross the sleeves at the back and tie the cuffs in front. Let the bottom of the first shirt (white) hang down or tuck it so it doesn’t show. It’s your style, so you decide. I wore this on a cold day in New York when I wanted to still wear a white shirt in a really casual way. Button the last three or four lower buttons of your shirt. I mis-matched the buttoning for an asymmetrical hemline. Pull one side of the shirt over one shoulder. For added warmth layer this over a slim fitting polo neck. In spring you can ditch it. This long line assymetic hem shirt has the same effect. The belt shown in the above photo was threaded through the inside of one side of the shirt. The coat covers how the belt looks at the back when it comes out around the other side. The benefit of oversized cuffs is being able to pull them below coat sleeves for more of a play on traditional men’s styling. This Julia one shoulder shirt has the look done for you. You saw the full version of the above look in this earlier post. The first shirt is half tucked into trousers so one side hangs down. The second shirt is folded in half horizontally and wrapped around the waist. Like look 1, wrap the sleeves around the back and tie them at the front. I chose two different pinstripe shirts but you could use any color shirts you choose for example, the first shirt could be white and the ‘cumberland shirt’ could be black. The principle is the same on this gingham shirt I found online. I’ll do the above look again one day but with two different shirt colours. Make sure that you choose a shirt that is approx three or four times larger than you. Leave the top three or four top button undone. Pull the shirt off both shoulders, folding the collar flat against your back. 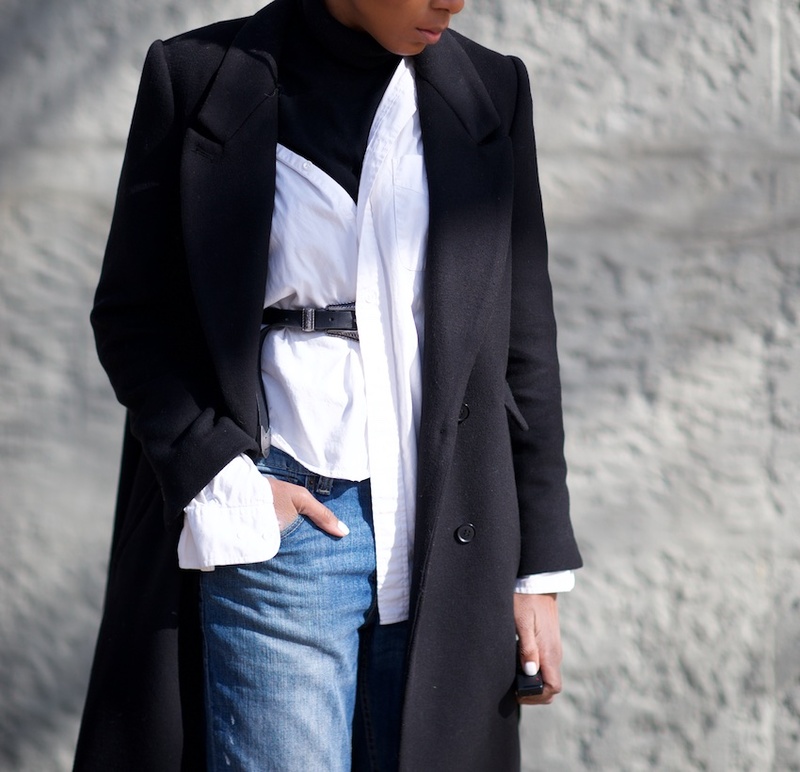 This version from Shopbop is done for you and shows you how the collar should lay. 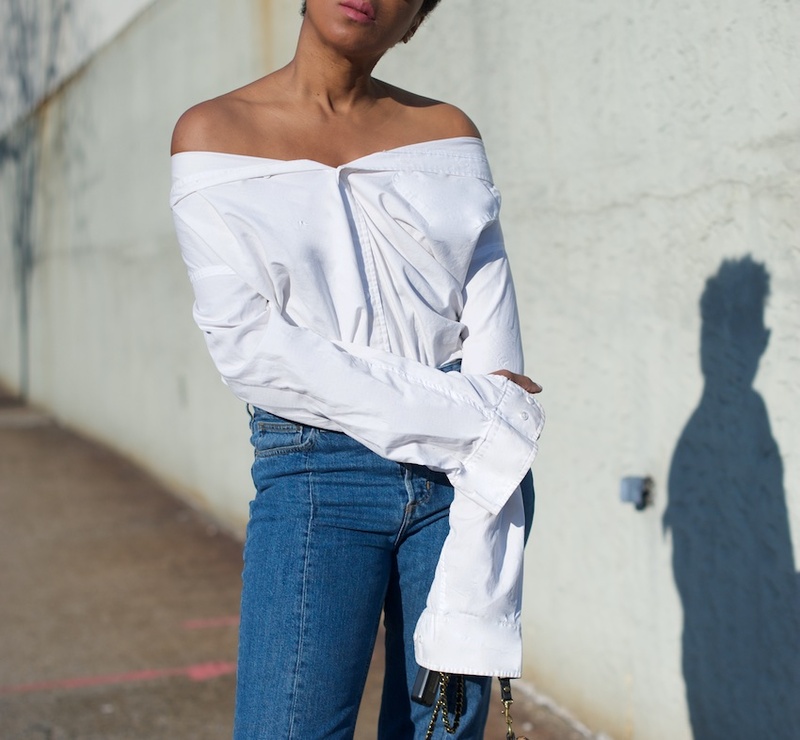 Also this Tibi off the shoulder shirt sits perfectly across the chest. I like to keep the cuffs un-done for all of these looks (note: last look is taken from this older post). Asos has a tie detail shirt that draws attention to the cuffs too. The same with this striped cuff shirt from The Outnet.